The last time The Magnetic Fields released a record with synthesizers was in 1999 with their three-volume album, “69 Love Songs.” For a band with genre tags involving the words synth, indie and pop, that’s a little unexpected, which makes the first album after their no-synch trilogy, “Love at the Bottom of the Sea,” all the more exciting, especially when so much has changed in the past decade. Unfortunately, this album probably should have been left at the bottom of the sea. The first track, “Your Girlfriend’s Face,” gets tiring after the first 20 seconds. The vocals are whiny, reminiscent of Bowling for Soup but without any of the self-parodying songwriting that makes shouting the lyrics to “Girl All the Bad Boys Want” so fun. The instrumentals would fit perfectly well in a kids’ show; they’re simplistic, almost more noise-punctuated with the occasional “pew” than any kind of sound or music. The second track, “Andrew in Drag,” is not any better. Much folksier than “Your Girlfriend’s Face,” “Andrew in Drag” forgoes most of the synths for plucky guitars and tambourines. This choice didn’t make the song any more interesting, however — just much more strange. The rest of the album is more of the same, annoyingly strained vocals backed by a cacophonous disarray of randomly selected instruments. The performance notes alone include cello, flute, guitar, banjo, piano, something called a “fun machine,” tambourine, autoharp, violin, viola, horn-amplified violin, musical saw, accordion and organ in addition to a variety of synths. There’s something to be said about musical experimentation, but this is less experiment, more misguided performance art. 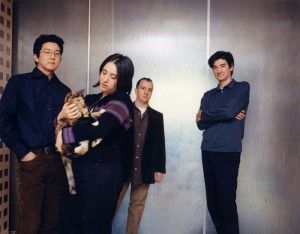 If The Magnetic Fields weren’t founded in 1989, I would swear that they were trying to ride the Zooey Deschanel-inspired quirky-is-cool cultural wave. The sole redeeming quality of “Love at the Bottom of the Sea” is the clever lyric-writing. As preposterous as the subject matter may be (a sampling of the song content: what a hit man will do to someone’s girlfriend’s face, falling in love with a friend dressed in drag, cockblocking someone due to religion, killing a unicorn for love, how “Hugh” and “you” sound alike), the wordplay is well-done. Stephin Merrit’s lyrics are clever, with each verse flowing naturally into the next, gently guiding the listener along something that might break their minds otherwise. The impeccable wordplay is aided by the fact that each song is short, on average around 2:10 long, with no songs over 2:39. But ultimately, well-crafted witticisms are not enough to gentrify the chaotic instrumentation or buoy the weak vocals. “Love at the Bottom of the Sea” is not only easily forgettable; it forces you to purge it from your memory as quickly as you can. The final track, “All She Cares About Is Mariachi,” sets the perfect tone to end the album. If I had a choice between listening to this album the entire day or be followed around by a mariachi band, I would probably pick the mariachis.